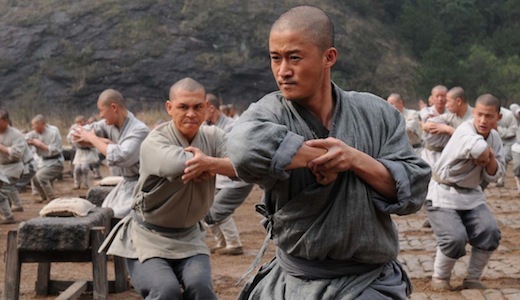 Shaolin is a great film, but be warned it is really more of a drama that has martial arts in it than the other way around, but for this story that’s fine. Toward the end there is still enough martial arts to satiate the palette of the most discerning martial arts film fan, or to put it bluntly plenty of asses get kicked. Corey Yuen’s fight choreography is well done here, and is staged perfectly. The only caveat is that there is just a bit more wirework than I would’ve wanted, but that’s more of a personal issue for me. Shaolin is also a beautiful film, and the first thing you’ll notice is the fantastic cinematography. The scenes are staged so that the sets and backgrounds can be seen in all their glory. The destruction of the temple toward the end of the film is nothing short of spectacular. All of the actors involved do a fantastic job, starting with Andy Lau, who is great as Hao, and is convincing in his transformation from confident evil warlord to repentant monk. Nicolas Tse is also good as Cao Man, a man more ruthless than Hao, and his story arc and conclusion is satisfying and appropriate. Jacky Wu Jing is also good as the head instructor, but isn’t as memorable as his character should’ve been(this may have been due to the interpretation of the character within the script). His fights were excellent, however. 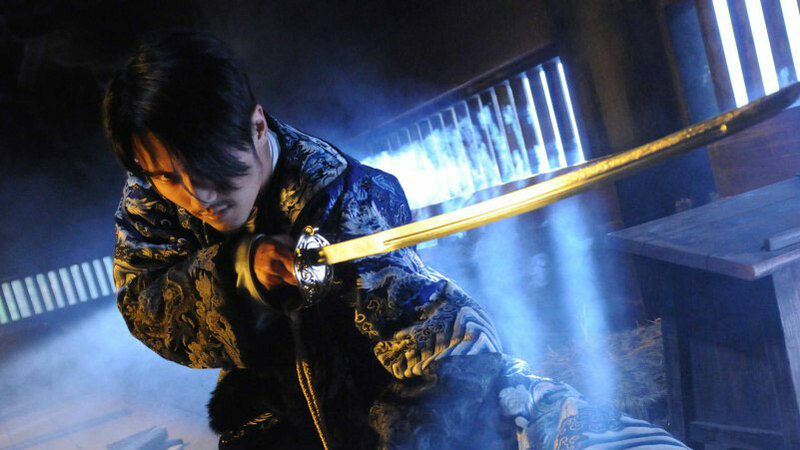 One other possible reason why he’s not as great as he should’ve been was because of the work of Xing Yu as his second, and this is an actor who has been in many martial arts films (Ip Man and Flashpoint come to mind) and dang it, he needs to get a starring role in something. He’s got a great on-screen presence, and his kung fu is pretty darn good as well. He outshines Wu Jing in every scene they have together. 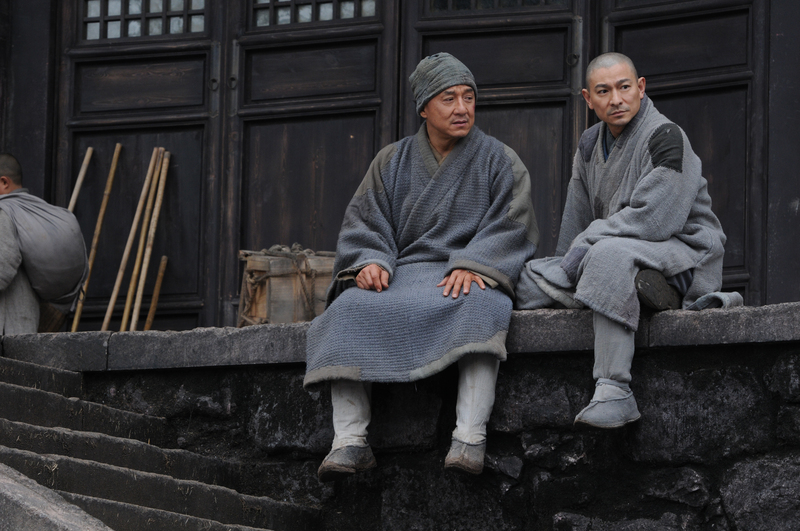 Jackie Chan is also good as the Shaolin cook Wu Dao who isn’t disciplined enough to be a monk, and the Abbot is trying to get Dao to see the world, but he’s too scared to leave. He gets a good fight scene that isn’t classic Chan, but close enough to see he has one last good/great fight scene left in him. One great bit of casting is bringing back Yu Hai, who played the original head instructor in Jet Li’s Shaolin Temple, now plays the Abbot in this film, and shows that he’s still got a few fighting moves left in him! If you are a fan of Shaolin Temple, you’ll be tickled pink to see him again. It’s an extra bonus to an already good film. CHOREOGRAPHY: (8) The fights are really good, and there could’ve been more, but this is a drama first before an action film, but Corey Yuen does a great job here. Wu Jing’s final fight is great, but Xing Yu really steals the show here, especially at the end. Nicolas Tse versus Jacky Wu Jing toward the beginning is also a highlight. STUNTWORK: (9) They really went all out for this, and the fall of the temple was impressive, especially since the explosions take place so close to the stuntmen. Andy Lau did some impressive stunts himself. STAR POWER: (10) Heavens, just read the cast list. ‘nuff said. FINAL GRADE: (9) Shaolin is a great film, that explores one man’s spiritual transformation amidst the backdrop of the spectacular fall of the Shaolin temple. Great review – I’m really looking forward to seeing it. I’m a bit worried that there aren’t enough fights though. I saw Young Bruce Lee a couple of months back and there was far too much drama. Still looks like an essential purchase though. 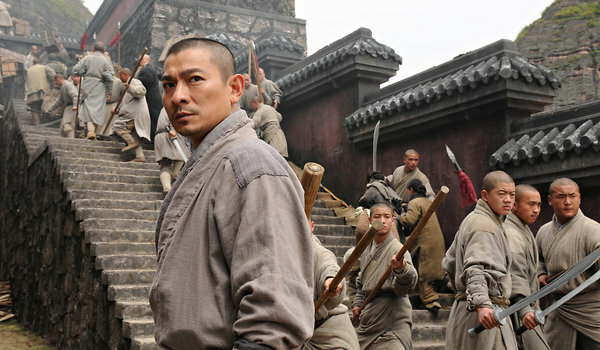 Jamie – don’t worry, there’s plenty of fighting in Shaolin, it just makes room for the drama to unfold at the same time. Excellent review, Mike, as always. Good shout out to Xing Yu, who I think I spotted in Black Ransom which is a pretty decent, low key action movie with Simon Yam. good, well written review – it gives me a good idea of this film’s strengths and weaknesses. Good to know that Yu Hai makes an appearance. He was so great in the Jet Li films. Thanks, all! It was a good film that I do recommend, and seeing Yu Hai was a great thing, and also to see that he gets his own fight scene! The old guy still has it! I hope my martial skills will be as good when I’m that old!